Scholarships Matter is a series of stories highlighting students in the College of Arts and Sciences who have received and been impacted by scholarships. The student featured in this story is the recipient of one College-wide scholarship, the Lauris D. Graves and Jacqueline D. Graves Endowed Scholarship. Scholarships like these are made possible by generous support from our alumni and friends. John Davis Diaz was practically raised in a dentist’s office: his dad owns his own practice in Tuscaloosa, and soon after he purchased it, Diaz was born. But, as the senior biology major knows all too well, dental school is expensive, which is why he is so grateful for the scholarships he has now. After Diaz graduates—both from UA and from dental school—he wants to go into practice with his dad, doing more than just cleanings and fillings but helping with cosmetic surgery as well. He said that, growing up, he saw people come out of his dad’s office totally transformed by their smiles and he wants to do the same. Already, Diaz has helped to bring smiles to those around him by the service he gives to UA and the greater community. He is an ambassador for the College; he jumpstarted a new chapter of the duck conservation group Delta Waterfowl, raising more than $20,000 in the process; and he has loved mentoring younger students through the honors independent study course BElieve UA!, which gives students the opportunity to develop leadership skills while aiding other UA students. The Dr. Lauris D. Graves and Jacqueline D. Graves Endowed Scholarship in the College of Arts and Sciences was established in 1997 from gifts given by Mrs. Jacqueline D. Graves, widow of Dr. Lauris D. Graves, to honor the memory of her husband.  Scholarships from this fund are awarded to students enrolled in the Department of Biological Sciences within the College of Arts and Sciences and who intend to enroll in an accredited medical school.